Israel has repeatedly struck targets in Syrian territory to prevent Iran from establishing a base in Israel’s northern neighbor, as well as to prevent advanced weapons from reaching Syria’s ally, the Hezbollah terror group. 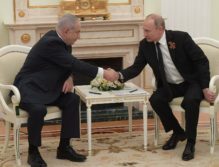 However, Russia’s plans to upgrade Syrian air defenses and to assist in hampering efforts to attack Syria by air will complicate Israel’s actions. The Russian announcement comes after the Israeli military, in a series of tweets to the IDF Spokeperson Twitter feed on Sunday, summarized their After Action Review on the Russian plane incident.